If you visit the homify site often, you are well acquainted with our 360° ideabooks which display exciting architectural projects. If this is your first time with us, you will soon find out that we love architecture and spectacular houses, searching far and wide to bring the best examples directly to you. Today we bring you another such example, all the way from the Ukraine. It is an excellent specimen of modern architecture and contemporary design, sure to entice the imagination of anyone interested in high quality living spaces. Marrying geometric volumes with eclectic materials, the building belongs well within the realm of the ultramodern. If you are looking for mind-blowing new architectural projects, you have come to the right place. Let's get started on this one! 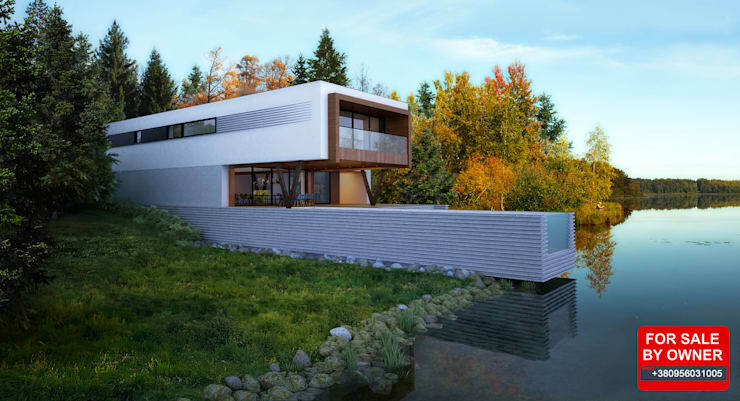 Our first meeting with this modern home is certainly impressive. The building seems to be in a state of movement, thanks to its elongated horizontal structure and repeated parallel lines that flow in one direction. The architect for this home, Aleksandr Zhydkov, clearly wanted the house to suit its natural surroundings very well. The surroundings in question is a beautiful property located in the town of Dnepropotrovsk. We can just see in this image the wealth of natural vegetation at the home owner's doorstep—lovely, multi-coloured trees and, of course, the crystal clear lake next to which the home is built. 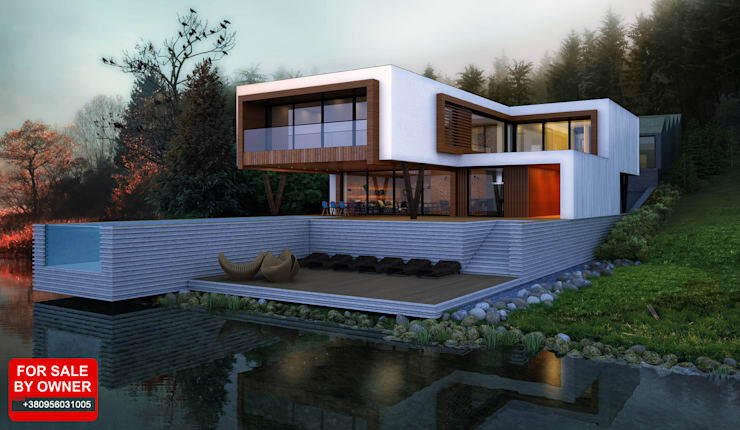 Zhydkov managed to integrate the house so well within the natural flow of nature. The building looks like a pier extended over the lake, or even a vessel floating on top of it. Now here we can see the exterior of the house from a different angle. The building certainly fits into the current trends in contemporary architecture, with geometric volumes stacked on top, and overlapping one another. In this case, however, the integration seems less rigid and more fluid, extending the idea of dynamism we discussed in the previous image. This is largely due to the rounded and soft edges and corners of the structure, as well as the use of wood in the facade. Down by the mirror lake we can see a patio, neatly hidden behind the volume of the house that leads onto the water, and which, as we will later see, houses the swimming pool. This patio descends all the way to ground level, making it significantly lower than the rest of the raised structure. The result of this is a very private outdoor living area. Although it is completely open to nature, it is sequestered by the larger building in such a manner to retain privacy. Now we get a chance to take a look inside this luxurious home. It is immediately apparent that although there is a strong emphasis on design trends and contemporary style, nature and the natural surroundings of the home are still paramount. This can firstly be ascertained by the large windows that let in ample sunlight and views of the surrounding landscape. 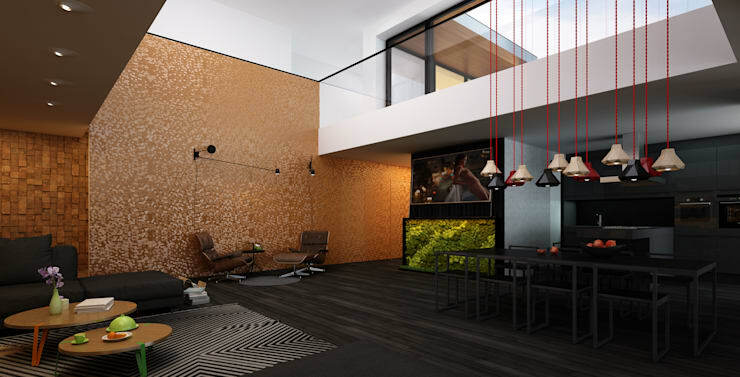 Furthermore, we can see a beautiful installation just below the television—a living wall! This one includes many different hues of green and serves as much as an artwork as it serves practical purposes, like improving the air quality in the house. You can learn more about the benefits of a living wall here. The flooring in this main hall of the house also consists of timber planks, continuing the natural theme and bringing a great sense of warmth and earthiness to this modern space. It is well worth our while to spend a moment on examining the use of colour and texture in this spectacular interior space. The two are employed in such an integrated fashion that it cannot be discussed individually. The first thing we notice is the shimmering brass wall to the right. The use of this colour brings a refined and sophisticated touch to the space, which is augmented by the waving texture of the surface, rendering the composition in an optical state of movement. It almost looks like melting metal, and the constant shimmer is quite impressive. The white wall above also holds an interesting texture. Two lighting fixtures can be seen on the white wall in this image, and it takes the form of a spot of lighting seemingly glowing from the surface itself, which also has a geometric tessellation over the lighted area. This is a somewhat abstract, but certainly very innovative addition. For our final image of this astounding home, we simply move on to the other side of the living room we have seen in the previous two images. We say living room, but it is actually the larger living area, since the interior on the ground floor is entirely open-plan. This, and the high ceiling, gives the room a generous sense of space. To the right we can see an extended and comfortable lounge area, and to the left, a spacious dining set. Above the dining table we can see low-hanging pendant lamps that stands as special feature in its own. The red, black and white lamps have geometrically formed shades that looks almost as if it was folded in the style of origami. A trendy addition indeed! Beyond the large glass window that overlook the porch, we can see the expansive lake to which the home owner can enjoy every day. We can also see the swimming pool and how it extends all the way over the water, to form an edgeless border, seeing as a glass panel is the only boundary. This is definitely a singular home in that it is so very in tune with both the latest trends in design, as well as its natural surroundings. 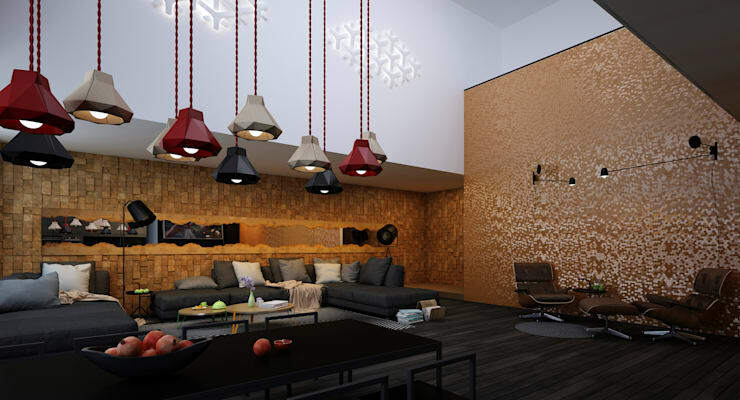 What did you think about the use of colours and textures in the main living space?